While devices for viewing websites keep getting smaller–web-enabled watches are a recent example–the challenges get bigger and tougher for website designers and developers. How do you create websites that effectively adjust to the size of the devices where they are being viewed, while also delivering essential information and links to the viewers? 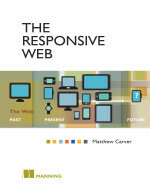 Carver’s book, The Responsive Web, goes well beyond simply showing and explaining a few web page templates. With clear text and excellent illustrations, the author offers numerous practical techniques and tips, and he provides the reasoning behind their importance, without wandering too deeply into web-design and user-experience theory. This superior how-to book reflects Carver’s real-world experience as “an early adopter of responsive web design.” As a front-end designer, web developer and consultant, his clients have included such notables as American Airlines, the Dallas Morning News, Chobani, Home Depot, and Google. The Responsive Web is divided into three parts, with a total of nine chapters. Starting at Part One: The Responsive Way, Carver definitely does not dawdle. In the very first chapter, we are offered “all the basic information you need to get started with responsive web design.” Chapter 2, meanwhile, covers a key concept in Carver’s approach: “designing for mobile first” when creating responsive websites. Bottom line, this is a very timely and useful guide for those who work with websites, as well as for those who manage web designers and developers. In other words, I have to look up stuff in books, mess around with code examples, and try to puzzle out why I just wrote a function that completely blew up when I called it. The clearer the how-to instructions and code examples, the better for my time-battered brain. So, here is no surprise: I love the “Head First” series from O’Reilly. Its books introduce topics in amusing, easy-to-handle bites (and bytes) that are well illustrated and presented in orderly progressions. Typically, you create a simple project and spend the rest of the text learning how to add functions or features to it and improve its appearance and overall usability. When I am in a mood to play for a few minutes or an hour or so, I enjoy opening a “Head First” volume. I can quickly teach my old-dog-self new tricks by working through a few of the examples and lighthearted explanations. First published in 2005, Head First HTML and CSS has now been updated to cover HTML5. If you are a newcomer wanting to work with web pages or expand some basic web-page knowledge, Elisabeth Robson’s and Eric Freeman’s new 2nd edition is an excellent guide. It shows, step by step, how to create standards-based web pages using HTML5 and cascading style sheets (CSS). Do not be intimidated by the book’s size (723 pages) and heft (nearly four pounds). It will get you off to a fast start learning basic Hyper Text Markup Language (HTML). Then it introduces each new topic in small steps, with plenty of screenshots, diagrams, notes, tips, exercises, and Q&A sessions to help you stay on track. Once the authors have tossed you in head first and helped you develop a reasonably good feel for HTML5 and CSS, then you can go look for the fancy stuff. You will have better notions of what to do with it once you have it. Dreamweaver website development and management software has been around more than 14 years. This makes it almost ancient by software standards. Yet, with each new release, it keeps steadily evolving, improving and adding more features and capabilities. And it is well-supported and stable. So Dreamweaver remains one of the most popular and widely used packages for designing and managing high-quality websites. One thing you still don’t get with the Dreamweaver software package, however, is a printed manual. So it remains a perfect candidate for O’Reilly Media’s popular “The Missing Manual” series. McFarland’s book shows you how to use Dreamweaver CS6 and how to create a basic website. From there, you learn how to improve, expand, add features, and enhance the usefulness and sophistication of your website. You also learn how to use the built-in tools to manage what you have created. Basic support for HTML5, including HTML5 tags and code-hinting. Whether you are an absolute newcomer or an old hand at using Dreamweaver, you can benefit by having and using this hefty how-to book. The fourth edition of this popular how-to book for Cascading Style Sheets is aimed at providing how-to examples, shortcuts and tips for busy web designers and web developers already working with CSS. However, web-savvy beginners and those who build and maintain their own websites also can benefit from this well-written book. Along with a short introduction to CSS basics, it offers many short code examples and related screenshots. And virtually every chapter is structured around answering the question “How do I…?” as each new topic is introduced. Indeed, the 420-page book is a compilation of answers to questions, specific how-tos and examples readily adaptable to real-world web pages. If you need a tutorial or refresher in HTML and CSS basics before grabbing this book, the author recommends Build Your Own Website the Right Way Using HTML & CSS, 3rd Edition, available in paperback and ebook formats.